If you're a couple or a small family, a 7kg washing machine is ideally-sized for your needs. It's often said that “Bigger is better”, but when it comes to energy-consuming appliances, this is not often the case. Smaller-sized washers are cheaper to buy and (usually) more energy efficient than larger ones. We've analysed over 200 models on the UK market in 2019, and put together a short-list of five for you to choose from. There are hundreds of washing machines on the UK market and over a dozen brands. This makes choosing the right model for your needs and budget quite difficult. To help, we've put together a quick checklist of the features you should watch out for. Modern washing machines are usually rated from A+++ to A for their energy-efficiency. However, this usually takes into account how much electricity they use (on average) over a course of a year. You can expect to pay more for an A+++ model - but this should balance out due to making savings on running costs. In compiling our list, we also look at another metric - Water Usage - and also how much water is left after spinning. On average, you can expect around 55% of water to be left on clothes once the cycle is finished. This means you will spend more time and energy getting your clothes dry. For reference, the best washing machines leave around 50% or under. Spin-Speed is another important metric for rating washing machines. The current highest spin speed is 1,600 rpm, with the latest models ranging from 1,000 rpm and upwards. A faster spin speed can improve washing performance and be used in super-quick 15-minute washes. A quicker spin also removes more water to cut down your drying time. However, a bit of a trade off exists. For starters, 1,600 rpm machines usually cost more money. They also create more noise. And it's also a bit of a marketing gimmick. 1,600 rpm is the maximum spin speed, but it is only reached for a fraction of the total cycle time during certain programs. If you're using a "Delicates" laundry program for example, it will never reach top speed. That's why variable-spin models are a plus as you can manually adjust the speed. How quiet your new machine is will also be an important feature to consider. The good news is, the models on the market in 2019 are much quieter compared to those available from 10 - 15 years ago. Each model receives 2 noise ratings in decibels (db). One during the regular spin cycle and one for the high / fast spin. It is worth knowing that 80dB is not just a little louder than 70dB, but is actually twice as loud! Something that really separates the more expensive models from the budget range are the number of different laundry programs and features they have. However, it's great that many washers now have "Quick Washes" - but you do need to look at the small print. On average, these take just 15-minutes (some take 30) but usually at a half-load or a reduced-load. ​Delay timers make things nice and convenient for running your machine at night or when you are out. You should expect a 24-hour delay timer as standard but again - you do need to check. Some have 20-hours and some only 16 hours. ​A long manufacturers warranty always adds additional peace of mind to any purchase. It also shows a manufacturer really stands behind their product. Sadly, a lot of washing machine manufacturers only offer the bare minimum 1-year guarantee! Using the ​key features we identified above as a guide, we have selected and reviewed five great 7kg washers for you. ​Hotpoint is one of the leading UK brands in kitchen appliances, and their WMAOD743G 7kg washer is up there with the best. ​​This loving-looking graphite model has been awarded the top A+++ energy-efficiency rating. It uses just 174kw per year ​which will cost you around £26 (using 15.4p a kw/h). ​Water usage is also great at just 8,770 litres a year. To put that into perspective, the average for this size is around 10,000 litres. The 1,400 rpm spin-speed is just under the maximum, but it ensures only 52% of water is left after spinning - which is pretty good. The control panel is a simple to use button and dial design, it is designed to wash woollens carefully, and it has an LCD display, so you can see what is going on at all times. 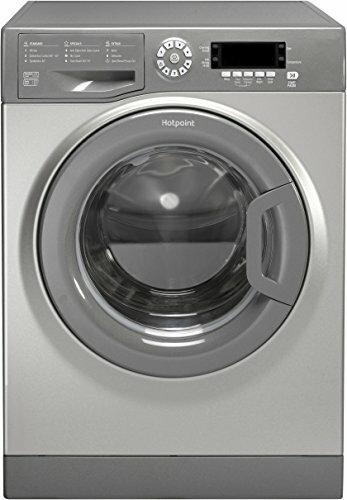 The features are pretty decent for the price and include an Anti-Allergy wash (which is also good for those with sensitive skin and babies), a 15-minute quick wash and ​Hotpoint's "Anti-Stain" technology. Let's take a look at that last one in this short video. ​This model also features a child-lock and a 24-hour delay timer. The major drawback with it comes in the noise department. It puts out 84db during high-spin - which is one of the loudest for this particular capacity. However, regular spin is much quieter at just 62db. The other downside worth noting is Hotpoint provide just a 1-year manufacturer's warranty. Still, the price is very reasonable and users really love ​how easy it is to use and the outstanding build-quality for the price. ​​Samsung's range of washing machines may not be extensive, but they've chosen to go for quality over quantity. ​​A case in point is the A+++ energy-rating. It has the previous Hotpoint model beat using just 153kw per year (on a 15.4p/h average) and ​costing around £23 to run. Water usage is incredibly low at just 7,400 litres per year. Like the Hotpoint, spin speed is a very decent 1,400 rpm. ​However, it a touch quieter producing 79 db during high-spin which is around average for this capacity. 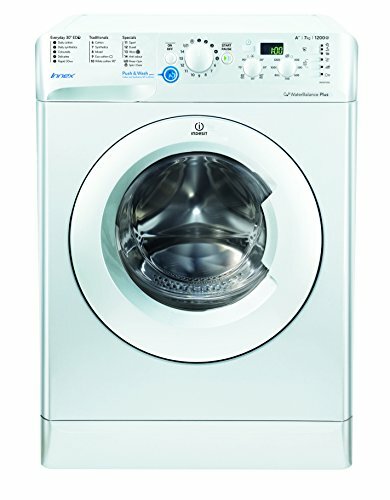 ​This Samsung model​ offers 14 wash programmes, including a mixed wash cycle and a 15-minute quick wash function. It also features Samsung's "Bubble ​Soak"​ technology, which not only helps loosen stains but it makes really effective use of water, too. On the downside, there isn't a 24-hour time - it's just 19-hours. However, t​o sweeten the deal Samsung have included a 5-year warranty which is much longer than the standard 1 - 2 years. If you're looking for a well-built graphite washing machine which doesn't cost a bomb to run - this makes an excellent choice. ​Our next pick is from another well-known washer brand, Indesit. ​​​It can usually be found cheaper than the previous models if you shop around. ​However, you do lose one or two features - and actually gain some really useful ones. ​This Indesit model is "only" rated A++, and that takes the energy-usage out to 198kw / per year, and an approximate cost of £30. Water usage is also around 20 - 30% higher at 10,230 litres per year. ​​So, you might be wondering why it made our list! Well, this is a really easy to use washing machine. It has a "Push and Wash" program, which means you're good to go in just 2 seconds. There are also a wide selection of programmes, including a mixed-load, an easy-iron​ cycle and even a sports-program for the kids P.E kits (which is really rare at this price point). There is a "Quick Wash" - but it is 30 minutes. With a more expensive model you can expect a quicker 15 minutes. ​The warranty is also just the bog standard one-year. But for this low-price, adding a few years on would probably still leave you in credit. All in all, this is a​n easy-to-use budget 7kg washer which can handle a small family's washing with ease. 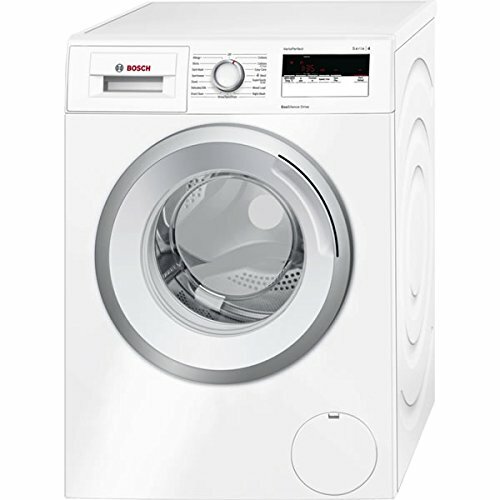 ​Bosch appliances are second-to-none, and this 7KG washer is neat, tidy and the very model of German efficiency. ​​​​You shouldn't really be surprised that it's been awarded A+++ for energy-usage. In a real East vs West battle, it comes in just 4kw/h above the Samsung model, using 157kw per year and costing approximately £24. This Bosch Serie 4 also uses slightly more water at 9,020 litres a year - but that's still better than the Miele model. ​​​A key difference with the previously reviewed washers is the spin speed. This one is only 1,200 rpm. That may put you off, but this makes it a lot quieter, making just 74db of noise during high spin. and a really-quiet 54db during the regular cycle. One interesting stat is there is there is just 53% of water left after the cycle finishes. That is exactly the same as the Samsung model, and shows Bosch are getting the most out of their slower spin speed. In terms of washing performance, there 15 wash programmes which include a 15-minute quick wash, a sports program and mixed-load cycle. It has a nifty reload feature that​ allows you to add clothes once the cycle has begun, and an "Aqua Spa" feature which showers your garments to save water and tackle tough stains. The only real downside with this one is there's a bit of a learning curve for operating it quickly and the instructions aren't the best. ​It does come with a 2-year guarantee, but it's ​so well-built​ you can expect it to last for quite a few years. ​Miele flys under the radar at times, but this German company manufactured one of the world's first washing machines in 1903! ​115 years later, they are still making quality washers, and their 7kg offering rounds out or list. ​The W1 WDB004 has the highest A+++ energy-rating and consumes 175kw / h per year at an estimated £27. ​​​​That's not to say this Miele is without its innovations. It uses a "Cap Dosing" system that prevents your detergent tray from getting messy and releases the mixture at just the right time. This video can show the pocess far better than I can explain it! That's pretty nifty. Another good use of technology is Miele's "ProfiEco Motor". This is basically an inverter motor that helps reduce noise. ​This model puts out just 74db at high-spin, ​tying the Bosch Eco-bubble for joint first-place. I must say, the 12 available wash programs are a bit disappointing. There isn't a mixed-load program, or a sports program, and the "Quick Wash" is 20-minutes (and not 15 minutes as others on our list). Miele advertise that this washing machine will last for twenty years. Unfortunately, their warranty only lasts for two! So in summary, it seems what you're paying extra for here is excellent build quality, quietness and top-rated energy efficiency. We love how efficiently it uses both electricity and water, its 15-minute quick wash and the sealer - a 5-year guarantee. We also feel the price makes it excellent value for money, too!